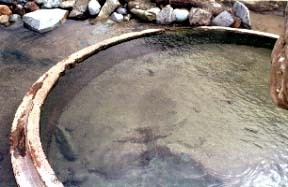 [Outline] Nagano Akiyamago @Sakae-mura, Shimo-Minochi-gun It is a dig-in-myself natural hot spring to attainment difficulty and a dry river bed in the Touji of an unexplored region, and winter. 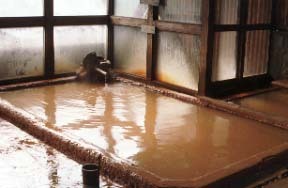 [Spring quality] a Kiriake hot spring 55 ° calcium sodium chloride and sulfate spring Water-white Wayama hot spring 49 ° calcium sodium sulfate and chloride spring Water-white Mansion hot spring 48 ° include sulfur sodium calcium sulfate and chloride spring Clouded white 45 ° of small Akazawa hot springs Ferruginous sodium calcium salt ghost spring Crimson It is salty (hot spring rest station 0). although it was not able to reach up to the day of 2000/2/24 heavy snow, and the Kiriaki hot spring -- Sakamaki this side -- a surface avalanche -- it was just desperate. But I would like to unearth an open-air bath out of snow targeting the day of fine weather. The medical-treatment spring of the color of a ferruginous with crimson small Akazawa hot springs including "the extempore open-air bath of the dry river bed dug with a shovel" of the Kiriaki hot spring and a mansion hot spring are Onsenkyo which has the characteristic to perform at once in the Wayama hot spring of an unparalleled view, and each, and cannot respond to the hot spring where included sulfur became cloudy, and it at a hot spring lover at them. 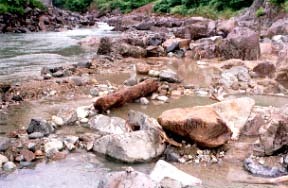 Uono River and a small fish river are known as a mecca of char, and the small fish river has not carried out in particular foundation seed preservation and discharge. 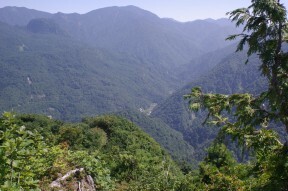 The center from the Mt. 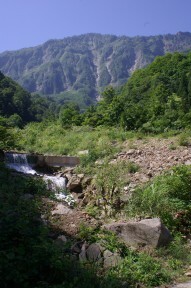 Torikabuto ridge, the "Kiriaki hot spring"
The back is a few people could reach "Mt. Saburyu." 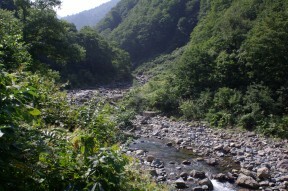 It is in the lower stream and the dry river bed in Nakatsugawa for a while from the juncture of Uono River and a small fish river.There is the good smell of decent sulfur in the 55 ° fountainhead.An open-air bath for exclusive use is built with a shovel, the water of a river is drawn, temperature is adjusted, and it is completion. neuralgia, the arthralgia, a frozen shoulder, a motor paralysis, and a bruise -- breaking -- etc. Rheumatism, a locomotorium obstacle, a wound, chronic eczema, keratosis, a physically weak child, etc. Women's diseases, a respiratory ailment, rheumatism and backache, a stiff neck, a trauma, gastroenteropathy, etc. Neuralgia, muscular pain, arthralgia, a digestive disease, hemorrhoids, recovery from fatigue, etc. * The fountainhead carries out sounds-like-Gobo-Gobo jet with carbon dioxide from a crimson hot spring and a pouring gate. It is R353 -> R117 -> R405 at 56 K or 85 minutes from Kan-etsu way Shiozawa Ishiuchi IC. It is R117 -> R405 at 100 minutes from Joshin-etsu way Toyota Iiyama IC. It passes through the Shiga Heights from field IC a Joshin-etsu trip, and is 80 minutes (moreover to [ However, a passing period ] a June - an October even the period those with traffic stop) at a path-through-a-wood course.